In October 2018, I set off with my gorgeous mate – Guin (warmblood), for a two-week Course – Advancing Four Savvies, hosted by Neil Pye and taught by Sam Caporn. 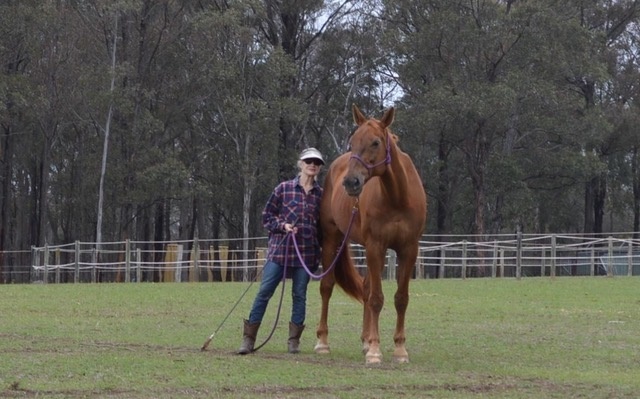 Since my first Parelli clinic – Forming the Partnership, in December 2017, I’d been ‘chipping away’ (with online help from Parelli Savvy Club) at efforts to continually improve my horsemanship. About mid year I knew I’d plateaued out and so signed up for Advancing Four Savvies in the hope of taking my understandings and skills forward. There’s nothing like being with a great teacher and 10 dedicated co-learners for 10 days to sharpen one’s insights around what’s going well, what needs tweaking and where to next! Sam Caporn’s presentation of theory and interaction with us, as a group and individually, brought great purpose and focus to time in the classroom and ‘on the ground’. The sound conceptual framework Sam drew from gave clarity, meaning and depth to every conversation, game, pattern and task as we played with our horses. – to give my heart and soul to my horse – nothing to think about except her and me! To say the least this course exceeded my expectations in every way! I’ve come home with a much stronger reference point for practising old and new learning and evaluating as I go. I feel more confident and renewed in my horsemanship journey. Many thanks to Team Parelli for your warm welcome, huge professionalism and the non-judgemental, completely supportive atmosphere you’ve created! My fourth visit and this is consistently my experience of Parelli Centre Australia!